This striking and unusual composition is rare amongst Olle Hjortzberg’s still life paintings, which generally depict flowers or fruit. It derives from the japoniste paintings of the late 19th and early 20th century, when the fashion for oriental fashions and artefacts was at its height, but it is treated with Hjortzberg’s characteristically fresh and contemporary approach. The colours are light and clear, the arrangement apparently arbitrary and casual, the viewpoint unconventionally direct. 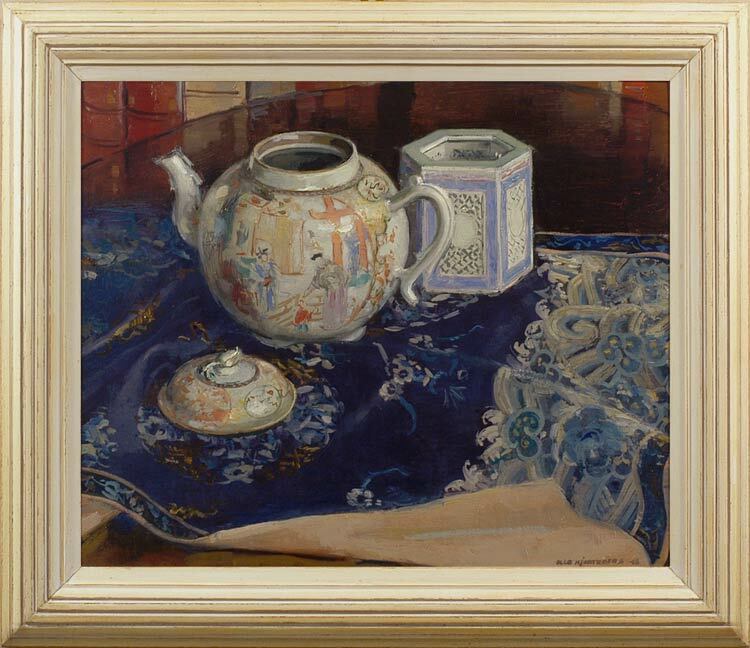 The porcelain teapot and jar are solidly rendered yet painted with astonishing delicacy, and at the same time the colours of the table, background books and the length of silk which covers most of the space are depicted with an opulent depth and intensity. There is something similar to Carl Larsson’s work in the clarity and luminosity of this painting, but Hjortzberg evokes a passionate sensuousness entirely absent from Larsson’s painting. He also displays an underlying awareness of the great masters of still life painting, from Velasquez to Manet. Gustaf Olof Olle (known as Olle) Hjortzberg lived and died in Stockholm, and was a versatile and creative artist. He trained at the Swedish Royal Academy of Fine Arts, of which he was later elected a member. He painted portraits and landscapes, as well as his characteristic flower paintings, in both watercolour and oil. He designed bookbindings, playing cards, book illustrations and bookplates, certificates and posters, including the artwork for the Nobel Prize diploma for literature in 1912, 1913, and 1928-30, and the poster for the Stockholm Olympic Games in 1912. He illustrated Gustaf V’s Bible, 1910-17, and the Swedish hymnal, 1912, amongst other books. He is also known for his decorative work in Swedish churches, schools and also the Palladium cinema in Stockholm (now the Cos Casino). Churches containing his work include Alby kyrka, Angermanland, a former mortuary chapel for which he painted the altarpiece; Flower Forest church in Värmland, with a triptych; Matteus Church, Stockholm, where he executed the mural Music at the gate of heaven (1946) above the organ, and also a stained glass window; Uppenbarelsekyrkan or the Church of the Resurrection in Nacka; Engelbrecht Church, Stockholm, where he painted the baptistery walls; and Sundyberg and Sofia churches, containing stained glass to his designs. He was appointed Professor of Drawing at the Royal Academy of Stockholm, a post he held from 1911-37; one of his students was Sigvard Bernadotte, the son of the king of Sweden, who lost his claim to the throne when he married a commoner. (Bernadotte went on to become a designer of furniture, porcelain, silver, stage sets and posters). Hjortzberg was Director of the Academy from 1911-41. His work was shown in the 1929 exhibition of Swedish art in Paris, and in 2003 his poster for the Olympic Games was used as a the design for a postage stamp by Sweden Post.